It was the winter of 2000, and I was *just* starting to come out of the closet. Welcome to my journey. 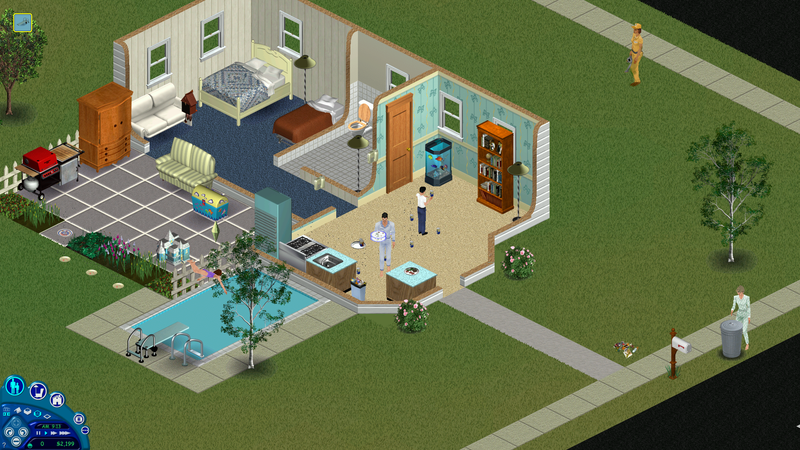 I’d like to thank The Sims for letting me create some of my first (small, semi-autonomous) role models. Freddie was supposed to look like Freddie Prinze, Jr. (who I had a major crush on), but I could never get the facial proportions right. He never had that Prinze pout. Instead of starring in teen slasher dramas, Freddie found a job as a “Subway Musician” through the newspaper (???) and caught a carpool to work every morning. There goes Freddie, catching the carpool to the subway. The sad thing about Freddie is he didn’t come out until three days before he died. He told a neighbor over the phone, and it was awkward, and he drowned in the pool a few hours later on ultra-fast-forward. RIP Freddie. I know what you did last (Sim) summer. With his robust side part and Kevin Richardson-esque goatee, Philippe was a Hot Sim. He was a Gemini — like me — so he was attracted to his roommate, Todd, an Aries. Philippe showed an early interest in music (I bought him a guitar, and for a week it was the only object that raised his “Fun” bar). After spending some time as a wedding singer, he eventually worked his way into the studio to record his first album (self-titled, simply “Philippe”). At a party the night the album dropped, Philippe kissed Todd. I watched, open-mouthed, as hearts erupted from their necks. Philippe died the next day, when his refrigerator caught fire. Taylor, a young political activist whose career was derailed by rumors of his sexuality. Throughout his (two-week) life, Taylor harbored a crush on his roommate, Gerald. One night on the veranda, Taylor attempted to flirt with Gerald, but Gerald resisted, pivoting and standing idle for several Sim minutes. This had an unfortunate effect on Taylor, who spiraled into a deep depression and started leaving little piles of trash around the floor of his home. David: urban, edgy, yet vaguely boyish. David never didn’t have five o’clock shadow, which is how facial hair works in the Sims universe — it was always five o’clock for the lower half of David’s face. The shadow, the grey camo shirt, and the 90s-era JNCOs were all part of a very specific Look, and I realize now that David may have been the early aughts precursor to Zayn Malik. Flitting between careers, he spent most of his time eating from pizza boxes and being beautiful. Rex, the writer of artsy novellas, who existed for a two-week period when I was procrastinating on a seventh-grade project about mitosis. Rex, O Rex, I miss you so. You were so talented, and showed so much promise before your untimely death at the hands of the microwave. Ty enjoyed a successful career as a surgeon before exchanging vows with Austin (below) at an intimate ceremony next to Ty’s mailbox. (Intimate, here, means it was attended by his female roommates and the mailman.) Ty and Austin tussled in a creamy blur beneath the sheets of their four-poster bed that night. I stopped time to take a screenshot. Austin spent the majority of his discretionary income on abstract art and sconces worth thousands of Simoleons. When he quit his teaching job to take care of his and Ty’s adopted daughter, he had to sell his antique busts and knockoff Pollacks. He cried into his hands. A few minutes later, he took up salsa dancing. Victor, the young Field Researcher. I still don’t know what a Field Researcher is, but I do remember that Victor spent a lot of time reading about science and using his virtual reality headset. He was promoted — from Lab Assistant to Field Researcher — the night before my bar mitzvah. Forever a bachelor, Victor died in a fatal oven fire as I was lip-synching “Seasons of Love” (my parents had just bought me the Rent soundtrack). Damon was created as a Matt Damon/Ben Affleck hybrid but of course he ended up looking like neither of the two. He aspired to reach the top of the “entertainment” career track, and thus could often be found talking to himself in the bathroom mirror. 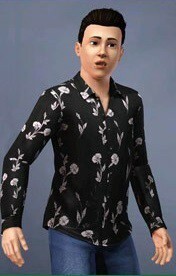 Damon was my first Sim to accept a romantic advance from another man — a computer-controlled bot named Mortimer. Though the relationship seemed promising, I stopped playing before it could really take off. Todd, shy and saturnine. He hid his sexuality for most of his life, until a dinner party when he kissed Philippe under a gibbous moon. The two never saw each other again, and Todd slid into obscurity. He went to work and pruned the herb bushes in the backyard, but he never answered the phone. His brush with Philippe showed him the person he could be, though he was not ready to accept that person. A few days after the kiss, Todd died alone when I sold all his doors. As much as I wanted to support his journey, I was twelve. I’m sorry, T.